The Platinum Collection of Slideshow Templates comprises eight sets of unique slide styles created by professional designers. There are 150+ exclusive templates - you're free to combine them in different ways to create thousands of slideshow movies. If you order the Platinum Collection rather than separate stylepacks, you receive eight best slideshow templates sets at 50% OFF their regular price! All slideshow templates are completely ready-to-use with integrated animation settings and stylish decorations. All you need to do is load the templates into SmartSHOW 3D software and add your photos and music - bingo! A professional-looking photo movie with stunning special effects is ready to be enjoyed in a couple of minutes. What does the Platinum Collection include? Romantic Wedding Slideshow Templates - perfect for making “love story” and wedding slideshows. The styles have a classic elegant look with a tender color palette. Gorgeous Wedding Slideshow Templates - exclusive styles for creating a professional wedding slideshow, combining premium quality designs and impressive animation. Travel Slideshow Templates - bright animated styles for making captivating photo movies about your seaside vacation and travel adventures. Present your holiday photos in an absolutely new way! Baby Slideshow Templates - great for creating funny and touching photo slideshows featuring different events of your baby’s life. Enjoy the bright design and amusing clipart! 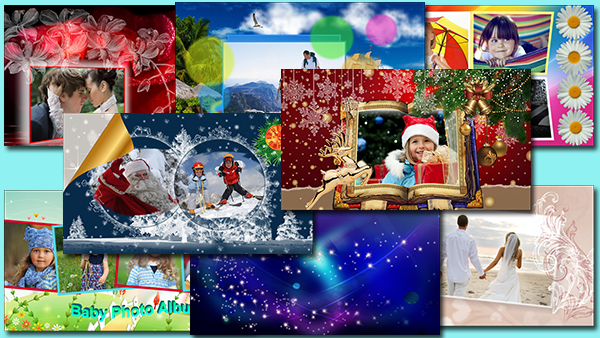 Christmas Slideshow Templates - gorgeous slide styles with traditional Christmas decorations. Feel the spirit of Christmas and add a touching element to the family celebration! Winter Slideshow Templates - amazing styles that will add a special charm to winter photos, featuring family vacations, winter sports and everyone's favorite winter activities. Stylish Slide Backgrounds - a collection of bright slide backgrounds with thoughtfully selected embellishments and animation effects. You'll easily find one that matches your slideshow theme perfectly! Get the Platinum Collection of Slideshow Templates at a special price now!